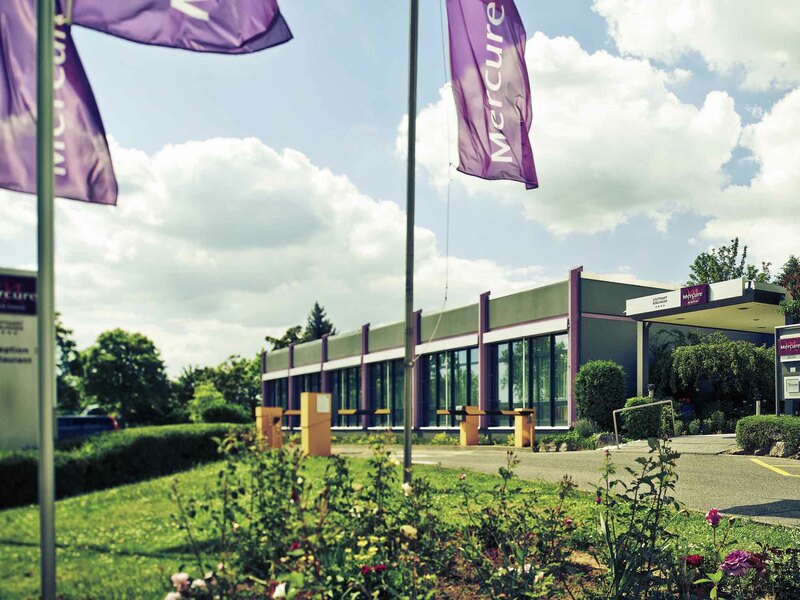 The Mercure Hotel Stuttgart Böblingen, located on the outskirts of the city, has 116 modern rooms. Free WIFI is available throughout the hotel. Seven meeting rooms are available for events holding up to 275 people. The 4-star hotel is CCH-certified and ca ters for a range of leisure activities with an outdoor pool with garden and a volleyball pitch. Arrival: Stuttgart main train station and Stuttgart Airport are both 15.5 miles (25 km) away. Parking is available at the hotel. The Stuttgart region is characterized by economic power and innovation-and a high quality of life: Many of the region's 2.7 million inhabitants enjoy living close to the picturesque scenery of the Swabian Alps and the Black Forest. If you are planning an event requiring a large exhibition space then you have come to the right place: Thanks to the ground floor events area with a wider and taller exterior door, even objects of a considerable sizecan be brought into the building effortlessly. The modern technology and smart service in our VDR-certified conference hotel will also help to make your business event or private celebration a success. The entire events area is air conditionedand has free WIFI. Four of the seven rooms can be combined as required and provide sufficient space for up to 275 people. You can count on our support for the planning and hosting of your event. At the 4-star Mercure Hotel Stuttgart Böblingen, you can choose between Standard Rooms with twin beds or a queen-size bed. The Family Rooms have a queen-size bed and a sofa bed. Our Superior and Privilege Rooms have a queen-size bed.We have rooms available for guests with reduced mobility. All 116 rooms are air conditioned and have free WIFI. Two children aged up to 16 may sleep in their parents' room free of charge. Your pet is welcome (charge of EUR 10/night). In addition to a TV and telephone, our Standard Rooms also feature a high-quality bed, comfortable chair, functional desk space with free WIFI, a safe, tea and coffee-making facilities and 1 bottle of water. In addition to a TV and telephone, our Standard Rooms also feature high-quality beds, a comfortable chair, functional desk space with free WIFI, a safe, tea and coffee-making facilities and 1 bottle of water. Our Superior Rooms feature high-quality beds, a comfortable chair and a functional desk space with free WIFI. Tea/coffee, a bottle of water and double loyalty points are also free of charge. Privilege Rooms for added comfort: VIP bathroom including bathrobes, mineral water and coffee and tea facilities in the room plus free newspaper. WIFI and late check-out also included. The "Vision" restaurant is open daily from 12 noon to 2pm and from 6pm to 10pm. Regional specialties are served alongside appetizing international dishes, which can also be enjoyed on our terrace. Enjoy classic long drinks, delicious cocktails and wine from our selection of Grands Vins Mercure in our "Bistro.com" bar from 12 noon to 1am. My stay was ok, the toilet smelled like a sewer, but I closed both doors going into my room and the WiFi is sub-par as usual. I couldn’t work from my room using WiFi at all. Restaurant and Bar were closed for the weekend and we were unaware why. We received no notice of this and after a long trip we wanted access to easy food and drinks. Free snacks had gone by the time we arrived and there was only one restaurant available in the near vicinity. My stay at the Mercure Hotel Stuttgart Boeblingen was fine insofar as the hotel location was within easy distance of where I was visiting and also not too far from Stuttgart itself. The standard room was clean and the bed comfortable. The bedroom door is operated by key card and I had trouble with my card on at least one occasion when I had to go to the desk for help. At other times it took several attempts to open the bedroom door. The TV in the bedroom appeared to have missing channels or at least channels which previously existed were now blank which I found annoying. The hotel itself particularly the bedrooms and corridors could do with a refurbishment as they are beginning to look a little drab. Also the single small lift is a nuisance particularly when trying to check out and there are many other guests trying to access the lift at the same time. I found the staff to be very friendly and helpful and the breakfast in the morning is very good. Would I stay here again? Probably yes because the location is good for me. I wonder what the better rooms offer over the standard room? Basically everything ok. The building is old and could use a construction. I stayed at the hotel during a business trip. I was told that the hotel uses an central air-conditioning. The room allocated (404) was facing the sun during the day. The room barely has any air-conditioning. It felt like a sauna room to stay or even sleep in the room. And, the pipe broke on my last night of stay. It seems like the hotel infrastructure needs a major overhaul. I reserved and paid for the hotel on Expedia. However, during checkout, the staff insist that they did not received any payments from Expedia and wants to charge my credit card. In the end, I end up paying twice for the stay. And, I am still working with Expedia to get my refund from the hotel. The only positive about the hotel is the location. Otherwise, the hotel can use a major overhaul and upgrade on customer service. I was there for business and the location was very good for me also because of the SBAHN station. breakfast is quite good, but rooms need a refresh. Also the TV is almost not usable, maybe it allowed me to be more focus on work! Hotel accommodation is good if compare with the room rate but the elevator has only 1 and quite small. Sometime we are better use ladder as we need to wait for elevator for too long. Dinner in the restaurant is delicious and well take care for hotel staffs. My overall stay at this hotel was very good. The rooms were clean and despite the hotel building being old, the rooms were modern and clean. The staff was nice and the internet speed and reliability was one of the beast I've had at a hotel. Definitely four star quality hotel! This was our 2nd stay at this hotel which we have identified as a great stopover hotel on our European travels. The hotel is lovely - the restaurant area is inviting. We had a room on the top floor and this corridor smelt strongly of smoke and looked like it could do with some tidying up (stained carpets, dirty walls). The room also, although absolutely fine for a 1 night stopover, was in need of some attention. There were major outside building works going on so it will be interesting to see the garden when finished. Our night's sleep was interrupted by some activity in the stairwell next door. Had to stay at this location recently for two nights with sub-zero(°C) outside temperatures. At arrival the room was too cold and when I left it still wasn't even close of being cozy despite all the tricks I tried to try to make the heating system to dissipate more heat. An as an aside, if you arrive there on Sunday evening be prepared to have a very limited menu choice for suppper and you should not count to find another restaurant close buy. The hotel satisfies every high standard. I especially appreciated the fast internet connection and the luxurious breakfast. Staff is friendly and helpful. I requested many times to have a room with a large bed... and I found an insect in my room. Nice room, nice and friendly service, not perfectly happy with the breakfast. Very reasonable rates. Easy walk to down town. Nice outside eating area. Professional staff who spoke excellent English. Elegant bar ... which was showing vintage music videos. Of course the beer was excellent. There was no way to hang my clothes in the room as the bar which carries hangers was missing. No fridge in the room was also a bit troublesome.